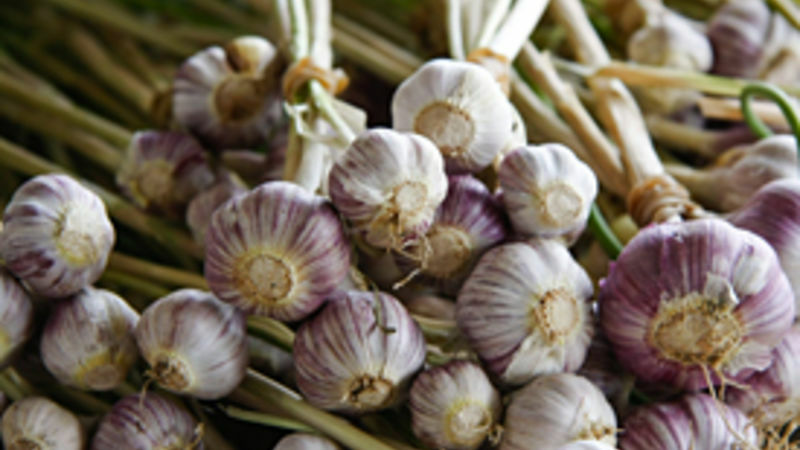 Choose garlic bulbs with firm heads and papery skin as they are easier to roast. Preheat the oven to 350° F. While the oven is warming, prep your garlic. Peel away just the extra white outer covering of the garlic bulb, not all the way down to the clove itself. Cut a half inch off the head (pointed end) of garlic bulb in such a way that the top of each clove is exposed. Place the garlic bulb on a piece of foil, large enough to wrap the bulb in. You can also use a clay garlic roaster, but if you have one of those, chances are you already know how to roast garlic! Sprinkle olive oil over the garlic, wrap it nicely with the foil and place it in the oven. Roast the garlic for 30 to 40 minutes until it turns soft, fragrant and brown. To roast already peeled garlic cloves, place in an oven proof dish and sprinkle with water and oil. Cover the dish with a foil, place it in the oven and roast as above. Allow the roasted garlic to cool down. Squeeze individual cloves to pop out the softened garlic and add it to whatever you like. You can easily store roasted garlic for a week by refrigerating it in an air tight container or by placing the cloves in a jar filled with olive oil.